A few years ago if you'd asked me about primer I wouldn't have known what you were talking about. Fast forward to the current day they're one of my favourite beauty products. A good primer can do wonders for your base and can prolong wear time for hours on end, even in the warmest of climates. They're perfect for evening out your complexion and skin tone and are heaven sent for uneven and scarred areas. I've tried a fair few over the years and I've quickly worked out what I like in my primers; to leave my skin feeling smooth and perfected. Without feeling like I've rubbed silicone all over my face which is a popular ingredient in primers. 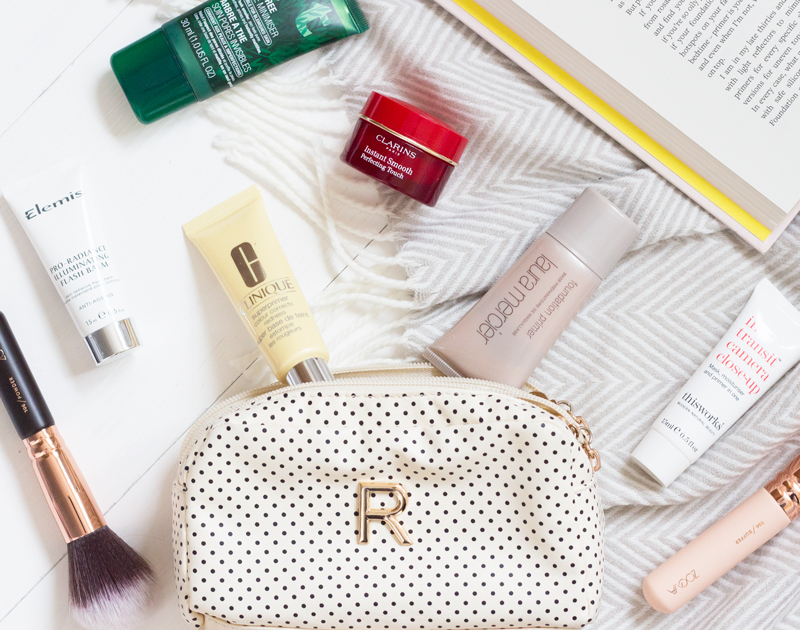 Here's a round-up of some of my favourites at all price points and formulas. THE BODY SHOP TEA TREE PRIMER: For when my skin is feeling oily and the weather is a blissful 30 degrees this is what I reach for. It's mattifying but it doesn't dry out the skin at all, it leaves a beautifully smooth base for makeup and generally makes the complexion look a whole lot better. With the added bonus of tea tree, it's great for when I have active breakouts too as it doesn't aggravate them in fact it gives them a helping hand. It's the most purse-friendly out of my collection, but it doesn't scrimp on the quality at all. LAURA MERCIER FOUNDATION PRIMER*: On those dull skin days this is my go to. I don't find this amazing for increasing longevity, but it keeps my base looking incredibly fresh. The gel consistency makes this product super cooling on the skin and is great just worn alone for a radiant looking complexion. If I were in the market for a primer this wouldn't be the one that I would go for as I think there are better for the price. Although it's not my favorite it's great for keeping makeup looking fresh but not so wonderful for prolonging wear time which is what I want in my primer. CLINIQUE ANTI REDNESS SUPERPRIMER: A complete hero product for me when I'm having a tough time with breakouts. I've never found anything that stops red beaming blemishes shining as much as this does. Not something that I would use on a dry skin day as it's slightly powdery in formulation. For that reason though it does create such a smooth and even base and really helps everything stay in place all day. The Superprimer line from Clinique has so many options to choose from that you're bound to find one that you love and I think they're really reasonably priced for the quality. ELEMIS PRO RADIANCE ILLUMINATING FLASH BALM: Elemis's answer to the well known Clarins Beauty Flash Balm. Again this is perfect on dull skin days as it brightens and tightens the complexion. It's also got moisturising properties so it doesn't tighten the skin to an uncomfortable level. Again this isn't one that offers a big increase in wear time but it just makes your skin look awesome so then in turn so does your base. CLARINS INSTANT SMOOTH PERFECTING TOUCH*: This makes me want to throw my hands up Emoij style and sing its praises. By far the best primer that I've ever used, ever! It does exactly what it says on the tin gives you a smooth perfected base for makeup. What I love about this is that it works at balancing the skin which is something I struggle to achieve sometimes. It glides over dry patches and evens out more oily areas. Whenever I've got a breakout erupting this works it's magic at making it look a lot less noticeable making it easier to conceal. THIS WORKS IN TRANSIT CAMERA CLOSE-UP: A product that is apparently a 3 in one, it claims to be a primer, mask and moisturiser. All I know that it's awesome for no makeup days which is something I've had a lot of recently. It plumps up the complexion nicely without making everything look a little too sheeny. I've not properly road tested it under makeup so I can't how well it performs under the summer heat. Currently a current freebie in Harpers Bazaar and is totally worth picking up if you were thinking of giving it a go before purchasing it full size.